The Saltaire Vintage Shop07817 443802work ShopThe Saltaire Vintage Shop is a treasure trove of vintage, antiques and hand-crafted items. You'll find beautiful clothing from the Eighties right back to the turn of the Twentieth century, sought-after vintage homewares and inspiration for gorgeous gifts. Four experienced dealers in vintage collectables, under one roof. 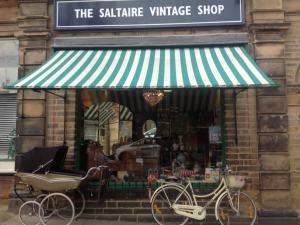 The Saltaire Vintage Shop is a treasure trove of vintage, antiques and hand-crafted items. 10.30 - 5.00pm Tues to Sun, closed Monday.